Canberra's Floriade, or Toowoomba Carnival of Flowers? Flowers, flowers everywhere! Spring has to be one of the most glorious times of the year! We shake off our winter woolies, begin to expose our pale, dry skin again and take a big breath to inhale all the fresh, new aromas starting to emanate from our gardens and parks. It’s also the time of year that thousands of visitors flock to two of Australia’s garden capitals. Toowoomba, in south-east Queensland, is known as The Garden City of Australia and holds the Carnival of Flowers over 10 days in the middle of September. Meanwhile, the nation’s capital, Canberra, comes alive with colour for the month-long celebration of Floriade. Each year the Carnival of Flowers is Toowoomba’s time to shine. Just like the bees, the entire city is buzzing with excitement as tiny bulbs, planted months ago, reveal their rainbow of colours just in time for the influx of visitors. Garden lovers from far and wide force ‘no vacancy’ signs to go up at hotels across region, so it’s a good idea to book accommodation in advance. For more than 60 years the Carnival has centred around the street parade. It’s believed that 50,000 people lined the streets for the inaugural procession in 1950 and today that number has doubled. Each year, on the first Saturday of the carnival marching bands, colourful floats, acrobats and well-known personalities in the town make their way past the crowd to Queens Park. “The parade usually marks the start of the school holidays and it’s so much fun waving to the procession while standing side-by-side with locals and visitors from near and far,” born-and-raised local Jodi Paynter reflects. “You’re entertained by clowns on bicycles, performers in stunning, bright costumes, floral floats and bands providing a marvellous soundtrack,” she adds. The family flavour continues at Sideshow Alley (Queens Park 16-18 Sept) where you’ll find rides, food trucks, show bags and fireworks displays. Entry is free, but you’ll need to grab some coupons for a spot on the rides that cater for the little and big kids. A relatively recent addition to the Carnival’s calendar is the increasingly popular Food and Wine Festival (Queens Park 16-18 Sept). Showcasing some of the region’s best drops and produce, this year the festival will be headlined by celebrity chef Miguel Maestre (from Network Ten’s The Living Room). ‘The Smiling Spaniard’ will host a gala dinner on opening night and will also be holding cooking demonstrations across the weekend. This is a ticketed event, so get in quick! Combined in your Food and Wine Festival ticket is entry to the Live Concert Series, which has an incredible line-up of Aussie talent this year. Birds of Tokyo, The Whitlams, Tim Finn and much-loved 80s acts The Chantoozies, Eurogliders and Models are spread across the three days (16-18 Sept). Bring your picnic blanket, grab a plate of delicious food, glass of wine and mates for a sing-a-long under the stars. “I take little people with me to sideshow alley and then extend my carnival weekend with friends at the Food and Wine Festival,” Jodi explains. While the first weekend is jam-packed with entertainment, the following week also has plenty to offer with exhibitions, displays, markets, tours and loads more. Plus, the parks and private gardens will also be open for you to wander through and marvel and the delicious sight and smell of springtime. If you’re a lover of certain types of flowers, be sure to check out the ‘floral’ section of the event calendar on the website, as organisations such as the Geranium Society, Bonsai Group and Orchid Society are hosting events across the carnival. An annual celebration, “Floriade is all about the arrival of Springtime and colour after the cold Canberra winter,” says Canberra local Erin Higuchi. As a city that well and truly experiences all the four seasons in their intended way, Spring really is greeted with gusto in Canberra. So much so, they’ve dedicated an entire month to celebrating it in the form of Floriade. 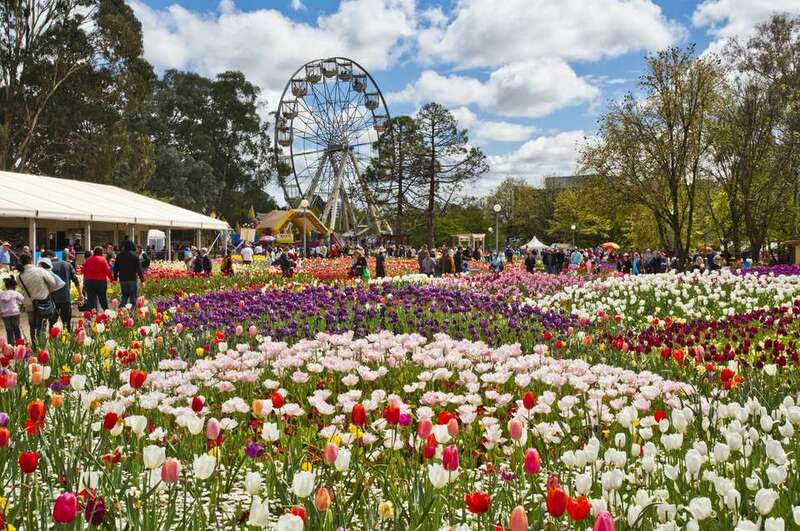 Established in 1988, Floriade has not been running as long as Toowoomba’s Carnival, but has certainly rooted itself in the annual calendar with around 400,000 people flocking to the event each year. It is held in Commonwealth Park, next to Lake Burley Griffin, with one million flowers blooming alongside live music, workshops, family entertainment and displays. “I love being out and about with all the other thousands of people enjoying the sunshine and being able to leisurely stroll through the different gardens, watch the performances and browse the stalls,” Erin says. Not just something to be enjoyed during the day, Nightfest (28 Sept – 2 Oct) begins at sunset with stunning lighting displays, roving performers, markets and entertainment. The Comedy Cave is always worth checking out, with a bunch of brilliant Aussie acts bound to get a few belly laughs. Foodies will love The Kitchen Company Tasting Plate. Local chefs wander through the food market, piling their basket with fresh produce, before returning to their make-shift kitchen to whip up a scrumptious feast. Two demonstrations are held alongside the markets each night. No one loves having a good sniff more than man’s best friend. That’s why one day is set aside for Dogs Day Out (11 October), allowing pooches to come and explore Commonwealth Garden for themselves. Be sure to jump on the event website to check out the conditions and make sure your four-legged friend doesn’t go digging up any garden beds. Floriade or Carnival of Flowers: Which is best? When it comes to a springtime festival there’s bound to be something to love. Flowers just make us happy! But it seems 60-plus years of experience has given Toowoomba the edge. Despite the Carnival of Flowers being held over just 10 days (around a third of the length of Floriade), so much has been packed in and in many ways, it offers more than Floriade. There’s not just one central park to marvel at. While Queens Park hosts the larger events (sideshow alley and the​ Food and Wine Festival) Laurel Bank Park, the Japanese Gardens, the Rose Garden and even private home gardens are all spruced up and on show. Plus, there’s the street parade, which takes you back to yesteryear and is a reflection of the city pride that the event brings out in all locals. Floriade is still a sensational event, but we think the Carnival of Flowers may just hold the trump card. Canberra may lay claim to being the Nation’s Capital, but Toowoomba rightly holds the title of Australia’s Garden City.